I spent the weekend with students from three Sri Lankan state universities – Eastern, Jaffna, and Peradeniya – as they prepare a performance act for the forthcoming Galle Music Festival. They are working under the direction of Dr Arunthathy Sri Ranganathan, and faculty members from their respective Performing Arts departments. The focus is on traditional music and dance, but Sri Lanka’s multi-ethnic population means that these traditions vary widely across the island. 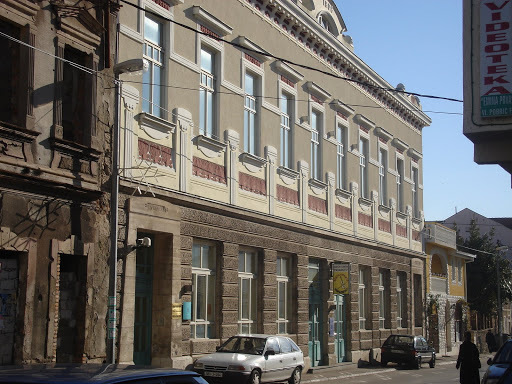 What’s more, with the three universities based in geographically distant and somewhat war-isolated areas (one in the North, one in the East – both areas were epicenters of the civil war that ended in 2009 – and one in the central, mountainous region), opportunities for cross-campus exchanges and collaborations are not in the usual course of student life. What’s been fascinating to observe this weekend are the points of commonality – social, cultural, and aesthetic – and how these are found and navigated. The first point of commonality is the students’ shared love of music and dance, and Sri Lanka’s traditional folk forms in particular. If they weren’t interested in these, they wouldn’t be here, because the Galle Music Festival is primarily a festival of folk and traditional arts. (There’s a bit of fusion and rap going on to – but folk traditions are the foundation). The students from Jaffna and Eastern Universities are enrolled in Performing Arts degrees; the students from Peradeniya are members of the ‘Music Society’, a university-wide, student club for those with an interesting in performing music together. Another commonality is their age and stage in life – they are all university students, young people coming of age in a digital era with phones, photos, selfies and Facebook making up some of the artefacts and shareable commodities of their modern lives. Finding a common language is more problematic. All of the students are being educated in Sinhala or Tamil at university. Some students can speak both Sinhala and English; some speak Tamil and English. A smaller number speak both Sinhala and Tamil (although most of this generation are across the basics of both languages, they tell me). Therefore, conversations happen in second or third languages, or with the help of mime and gesture and a lot of good-natured laughter. 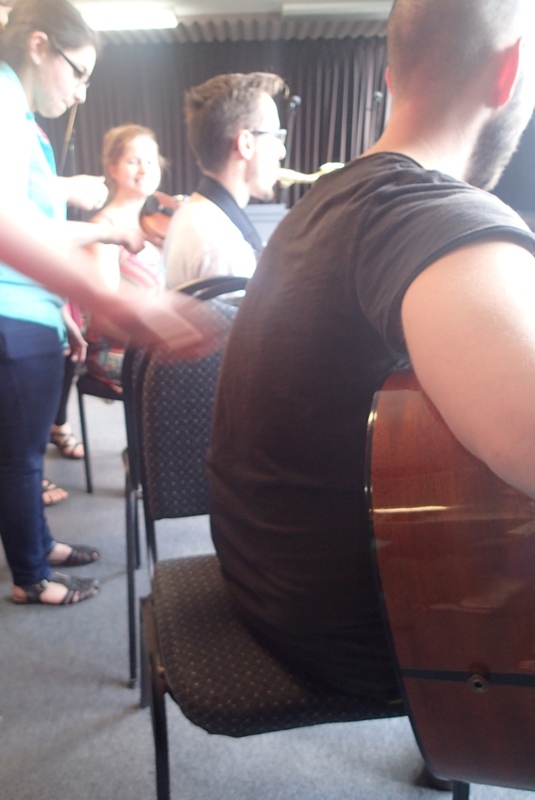 Each of the groups was asked to prepare a musical number to contribute to the workshop. Some had prepared songs with instrumental accompaniment, others had songs only, others had dances. In the full workshop with Dr Sri Ranganathan, they each first presented the music they’d prepared. Dr Sri Ranganathan made notes, and then proposed a form that would flow from one song or dance to the next. As they worked through this proposed form, students were roped into different roles. Four girls from Eastern University who’d come along to the workshop as singers found themselves dancing alongside the dancers from Jaffna University, who instructed them in the steps. In the very vigorous and rousing ‘Kavedi’, all of the boys had to dance, with very physical choreography requiring lots of jumps and deep knee bends, and Cossack-style kicks while crouching low to the ground. Impressive – and demanding! The students stayed in Colombo overnight, so I asked one of the Peradeniya students to keep an observation log of the interactions for me, as I’m interested in the ways that music collaborations can foster more positive intergroup group bonds and relations. She reported back to me the next day that in addition to lots of conversations in different languages, a highlight of the evening was an impromptu jam session, lasting into the wee small hours, when the instruments came out and everyone sang each other’s songs, played each other’s instruments, and generally just hung out and immersed in music the way music-loving young people do everywhere. The collaborations are one of the new programming strands in this year’s Galle Music Festival. Next week there will be workshops for the collaboration between two all-female drumming groups, one from the North, in the Kilinochchi area, and the other from the Academy of Music and Dance in Colombo. They will be joined by Sri Lanka’s premier women’s vocal ensemble – and possibly by me on clarinet, because the piece that is planned needs a Western melody instrument. It’s a bit of a departure from research observations, but what I love about my work is the constant interplay between music, ideas, collaborations, and intercultural learning. Whether I’m watching, writing or playing, that intersection is where the magic lies. 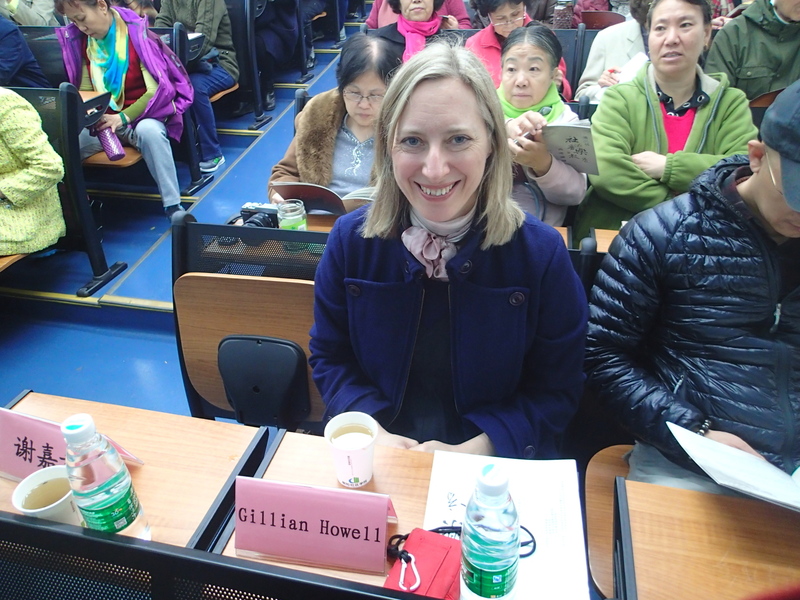 I recently gave a keynote presentation in Beijing as part of the Third Community Music Education Summit Forum, hosted by the China Conservatory. I was asked to speak about current trends in community music research, which was an interesting question to grapple with. It seems to me that in the absence of a neat universal definition of what constitutes community music (and I’m not saying there should be one – just observing its absence and the perennial discussion of “what is community music” that recurs periodically as a result) these kinds of historical overviews that dig into region/country-specific political-economic-social environments, shifts, changes, and trends are becoming increasingly useful documents. Lee Higgins wrote one that for me is definitive of the style, examining the historical context of community music development in the UK; Andy Krikun has written some fascinating accounts of the development of community banding in the United States; Roger Mantie has examined some of the historical shifts (albeit the a focus on language and discourse in key journals) of the wind band scene in Canada. Shorter overviews of other countries’ contexts for current practice were included in ‘Community Music Today’ (Veblen, Elliott, and Messenger, 2012). I’m hopefully the trend will expand further, and that we’ll see similar studies emerging from regions that are less-represented in the community music literature thus far. Related to these alternatives to a universal definition is a continued effort to offer frameworks or conceptual models for understanding community music activity. These turn up fairly frequently, and depending on what is being examined, offer varying degrees of usefulness (which means it is useful to have multiple options). Huib Schippers unveiled a very interesting set of three domains of community music at the recent Asia-Pacific Community Music Network meeting that draws upon his extensive work on music sustainability and eco-systems. The ecological perspective illuminates different aspects of music activities and projects – for example, providing a tool for understanding the community expectations of a community music intervention, which may differ from the expectations of its organizers. There’s a growing number of really interesting studies that explore this topic from different angles – pedagogy and informal learning, communities of practice, materials, different applications of technologies, as a participatory cultural practice, limitations and possibilities, and so on. The International Journal of Community Music devoted a recent Special Edition to this topic. I’ve also observed a growing presence for Sistema-inspired programs in community music research. 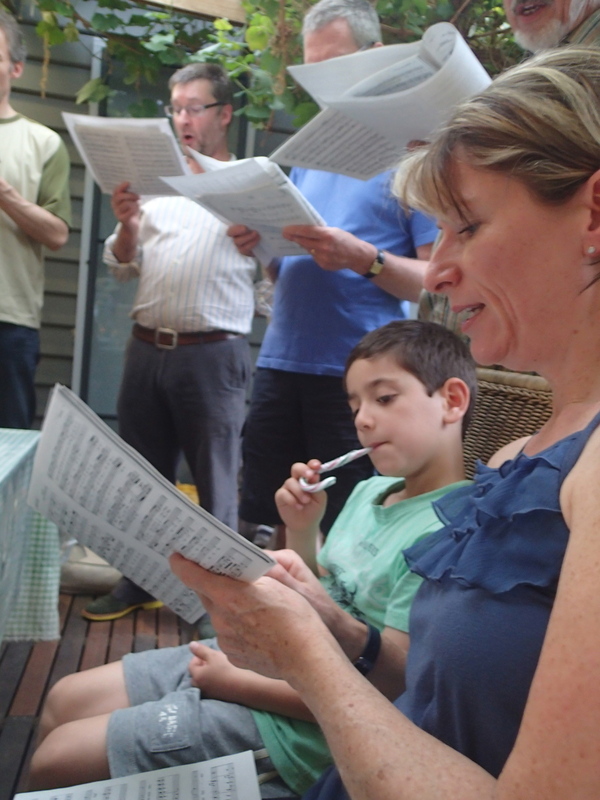 The twin goals of social care and music learning, and the complex contexts in which these projects work make these activities a good match with community music research. At present, research on this topic may still be more frequently directed toward pure music education forums, however, I’m anticipating a continued gradual positioning of this research in the community music sphere. What’s more, the next group of PhD scholars and researchers interested in examining a Sistema-inspired project can read an inspired/inspiring list of potential research questions in Roberta Lamb’s review of Geoff Baker’s ‘El Sistema – Orchestrating Venezuela’s Youth’. See pp. 178-179, here. Gender in community music. It hasn’t come in for much attention thus far, but it’s an important area for examination. Music is an extremely gendered practice; the paper “From snuggling and snogging to sampling and scratching: Girls’ non-participation in community-based music activities” (Baker, Sarah, & Cohen, Bruce M. Z, 2008) is well-worth a read for an initial examination to how this can play out in community-based music activities. Pushback against the ‘intervention’ model as the gold standard towards more organic, community-driven music approaches. I predict this will come about as non-English language community music work gains profile in the research literature. The relevance of this difference in emphasis of what practices look like and deliver was particularly evident at this year’s Asia-Pacific Community Music Network gathering (Japan, July 2015); indeed, the increasing ‘pushback’ was a topic that was discussed in the closing comments of that conference. Happiness and Joy. I predict that as researchers we will begin to look beyond the instrumentalised focus of many community music activities (or of their organisers’) to put the spotlight more firmly on participant experience, which will foreground some of community music’s least measurable, most subjective outputs – such as experiences of happiness and joy. Street bands and music-as-activism. I predict we will see an increase in the visibility of these kinds responses to social issues, and consequently they will begin to feature more prominently in community music research. The activities are not new, but I predict a revived interest in the dynamics of this kind of music-making as it interacts with local and global contexts for change and citizen action. What do you think? Are there trends in community music research that you’ve observed that could be included here? What are your own tips for the next ‘hot topics’ in community music research? I loved this return visit to Beijing. It’s always nice to be hosted, and the Chinese are wonderful hosts! My plane touched down at 3am, and when I finally emerged through the gates into the public area (that airport is enormous, it took me ages to walk through given I was still recovering from my recent surgeries), two very tired but smiling student volunteers from the China Conservatory were there to meet me. My first day was free of work tasks so one of the volunteers took me to the Panjiayuan antiques market where traders from different parts of China were selling antiques (some real, some less real) and handcrafts. I bought some gifts for family, friends and friends’ children, but mostly just loved the browsing and people-watching. 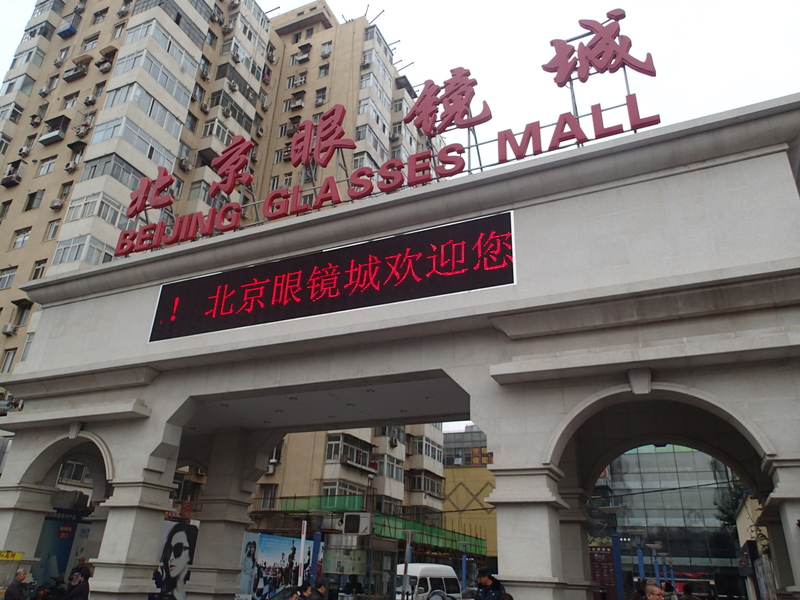 We also went to Beijing Glasses City. This is a mall filled with spectacle-sellers, lens-grinders, and optical accessories stalls. My student guide, Wang (although I later suggested an English name for him – Max – which he loved and immediately adopted) is from the Xinjiang Autonomous Region, up in the north-west, sharing the border with Kazakhstan and Kyrgystan, so Beijing Glasses City was a new discovery for him. I chose frames and got my eyes tested and had new glasses made within 30 minutes. The next day I led a music workshop for community music and dance teachers from around China, who were in town for the Community Music Education Summit Forum (I love that the event was both a summit and a forum). We did a range of collaborative composition tasks, using voices and body percussion. They were a great group. Though, I was reminded how tricky it can be to work with an interpreter in composition tasks. Sometimes, the pace of the work moves very quickly and I want to be able to give a key direction or piece of information in a very specific moment. It’s tricky to remember that if I just speak when I want to speak, the group won’t understand what I’m saying, and the energy behind it can translate as stressful urgency, rather than just in-the-moment encouragement that progresses the composition along in a critical point in time. A couple of times I really had to bite my tongue to give the interpreter a chance to move across the room to me and translate my instruction for the group. That evening, Max and I found a Xin Jiang restaurant where we ordered too much and had a fantastic meal of very Central Asian food. Max took the leftovers back to the dormitory for his room-mates. I was pretty excited to discover this new cuisine, although I also realized it was similar to I had had at the Uyghur restaurants in Kazakhstan. I fell in love with the sturdy wooden kebab sticks they served our meat on, and the wooden spoons that they served our yoghurt with. Max asked the waitress if I could buy them. She said no. My last day in Beijing was the day of my keynote presentation. We travelled together to the conference venue (a community college). There were a number of formalities at the start of the day, and I joined the group of presenters on the stage for many of these. My presentation was well-received by the group and afterwards I had the chance to speak with a number of community music educators. One told me she was delighted that I had spoken about the importance of acknowledging happiness and joy in community music. “That’s what it is all about,” she stated emphatically. In the afternoon, the student volunteers took me to see the China Conservatory. They walked me through the grounds, showing the impressive practice annex, and the student dormitories where they both lived. We had tea together in a small Xinjiang café in their basement student food hall. I fell in love with the beautiful teapot they served our green tea in and wanted to buy it. This time I didn’t ask though. It isn’t quite right to offer to buy the serving paraphernalia in every restaurant you go to, is it? 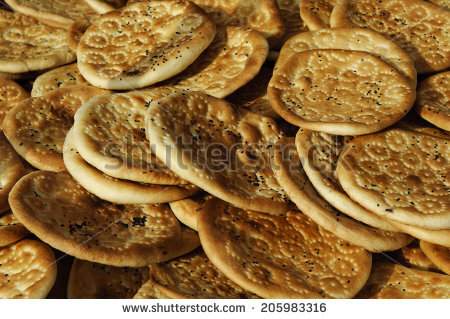 Max had brought me some Xinjiang snacks, which consisted of extremely hard round crispy breads, which he called naan. They were so hard I wondered if I might break a tooth. It felt a bit like trying to eat an enormous rusk. Then the time came for me to head to the airport, and both Max and Heidi (the second student volunteer) accompanied me there. They helped me with the check-in, organizing for me to have some assistance getting to the gate so that I wouldn’t have to carry my bag too far in my post-surgery state. Heidi had been the main person I’d communicated with prior to my departure and she knew I’d been ill, so was particularly concerned to take care of me. They both sent me text messages wishing me well in the couple of hours between our farewell and my take-off. They were the sweetest volunteer helpers ever! Thank you Max and Heidi for making this visit to China so delightful! In second semester each year I teach a 13-week Community Music Leadership course as part of Melbourne Polytechnic’s Bachelor of Music degree course. As part of their assessment for this subject, each student organizes to spend a minimum of 12 hours in a community music project, where their main goal is to observe an experienced music leader in action (rather than assuming a leadership role themselves). They are required to blog about these experiences, and the last class of the semester is run as a discussion forum, where everyone can share their reflections on what they have learned through the placement process and course content across the 13 weeks. A group of 5 students that did their placements in settings where the main participant groups had particular vulnerabilities/care requirements spoke very openly about how confronting and challenging some of their experiences had been, particularly during their first visits. They were working in settings such as juvenile justice detention, an immigration detention centre, a drop-in community centre for homeless and mentally-ill people, and a school for autistic children/youth. A main learning that they described was the importance of acceptance as a central ethic and value. One described how, while he knew that some of the young people in his placement site had committed very serous crimes, he realized that he didn’t need or want to know who had done what. Instead, his role as a musician and music facilitator was to accept everyone in the group as fellow human beings, sharing a common interest in music. Another suggested that, on face value, some of the people he interacted with in his placement looked like people he might have wanted to avoid if he passed them in the street somewhere. He learned how quickly those preconceived ideas would block any genuine connection he could make with the music participants, that he needed to discard those notions of ‘knowing’ people and come to the experience in an open, warm, and accepting way. 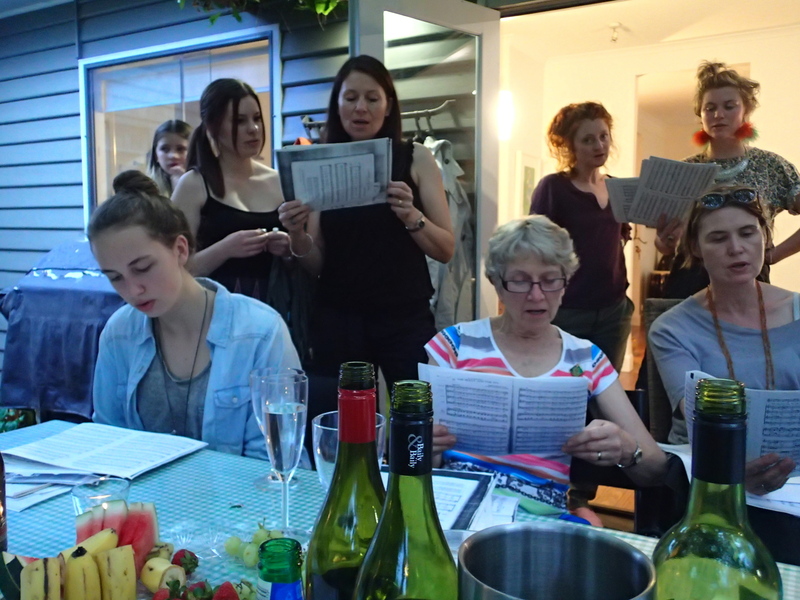 This is the hospitality that is inherent in community music – what Community Music Victoria trainers call the “active welcome” that intends to draw people into the group, to feel welcome, valued, appreciated, and free to be themselves, without fear of judgment or not being “enough”. Their arguments for a greater focus on mastery/attainment/excellence centred around the idea that a sense of ownership towards the group and its music could be achieved through participants being invested in their own progress and gradual mastery… they were less aware of the fact that for some members of the group, the pressure of having to ‘master’ their instrument or the music can detract from their enjoyment of the experience. Their grappling with this highlighted the way that ‘excellence’ in community music activities often does not refer to musical excellence alone. It is also about excellence of experience, about quality of relationships, and about being able to set and influence the agenda of a group in collaborative ways. A third point of discussion was of the importance of identifying and articulating your values, so that these will form the foundation of everything that you do, and can also be used as a central point of reference in decisions about programs, directions, priorities, etc. The student that raised this as a key learning for her had spent sometime working closely with the administrative staff of Community Music Victoria, and CMVic’s values are certainly front and centre of everything they do, as their website attests. Students also debated the inclusion/exclusion dichotomy quite vigorously. They considered the paradox of “inclusive” projects where particular groups who might be typically marginalized from the mainstream are targeted for participation – does this then exclude the mainstream? They also observed the way that ‘opt-in/out’ projects (where participants decide for themselves the extent of their participation, interacting and participating according to their own interests and comfort levels) create space for people to exclude themselves – and does this therefore mean they are less inclusive than they intend? Can you be actively and deliberately inclusive without excluding some? In other words, are they essentially two sides of the same coin, and one cannot be present without the other? We didn’t finish the student forum with any conclusions, more just a strong sense of the unresolvable nature of many of these questions. In community music there may not be any truly hard and fast rules of what to do and what not to do. Rather, the facilitator’s willingness to remember that “it depends”, and to remain alert to the subtle shifts and nuances within every group, adapting and adjusting in response to what they read and observe, is what determines their actions, choices, and leadership throughout the workshop and the project. My hope with the Community Music Leadership course is that the students – most of whom are in the final semester of their music degrees – will recognize community music leadership as a viable and (hopefully) artistically-satisfying and inspiring part of the portfolio careers that many of them will go on to build. They were a good bunch of students (they always are), and I finished the semester reflecting on how satisfying it is to teach a subject that I feel so passionate about to a generally personable, curious and open-minded group of very versatile and talented musicians. How does the post-modern world’s culture of participation and interaction transfer to the world of orchestral music? In recent training workshops I led with one of Australia’s symphony orchestras, we examined the concept of the fourth wall in order to prepare the ground for developing more flexible, interactive, connecting performances. The ‘fourth wall’ is the invisible wall between artists and audiences, creating a sense of a separate world in which the performance exists. It is created by way the environment is organised – audience seating, the lay-out of the performance space, and presence (or not) of a stage – and the performance style – including the amount of interaction between performers and audience (such as speaking, introducing, eye contact, smiles, etc), the performance dress, and even the behaviour of performers and venue staff. In orchestral concerts, we can see how every aspect of the performance environment and style communicates that the music is the focus. Such an intensely formal and distancing approach to performance can jar or distract when transferred to community contexts. In community performances, the music is not the only focus. It is the musicians and the music, and the people who are there, and the relationships that form when music is the medium and the reason everyone is there in that space at that time. Of course, the music is the primary attraction for the audience (they probably wouldn’t be there without it), but they are also attracted by the opportunity for proximity, or intimacy, or insights, or the chance to feed an interest and learn new things, or to access something different in their local environment. Many musicians have told me that interactive performances and workshops feel less important for them as performers than main-stage concert hall performances. The music may be less technically or intellectually demanding. A less formal environment can imply that the qualities of musical performance matter less. Audience interest in the person behind the instrument in some way undermines the importance of the music for the performer. These are important challenges to overcome if the inherent value and quality of what you do is one of the primary ways you derive satisfaction from your work. The music has a set form, which the artists know and work to. Notation and the through-composed nature of the work allows for increased musical complexity. Music is often cyclic or repeated as many times as suits the group. Reliance on memory and direction from within the group rather than notation limits musical complexity. Turino also argues that the two approaches to performance are so different, they should be considered on their own merits and according to their own values, rather than compared to each other. Therefore, a key step in developing more interactive, or responsive performance formats is one of adjusting mindset and understanding the different values that support these different approaches to performance. Participatory performance is not ‘lesser’ than presentational performance. It is a different approach to performance entirely (even if the musical content remains the same). There are clear trade-offs that take place when developing a participatory approach to performance. The presentational model allows for lots of predictability, little improvisation, and little risk. The participatory model is more unpredictable, more improvised (although with an overall intention and framework about how the participation will be managed), and riskier. 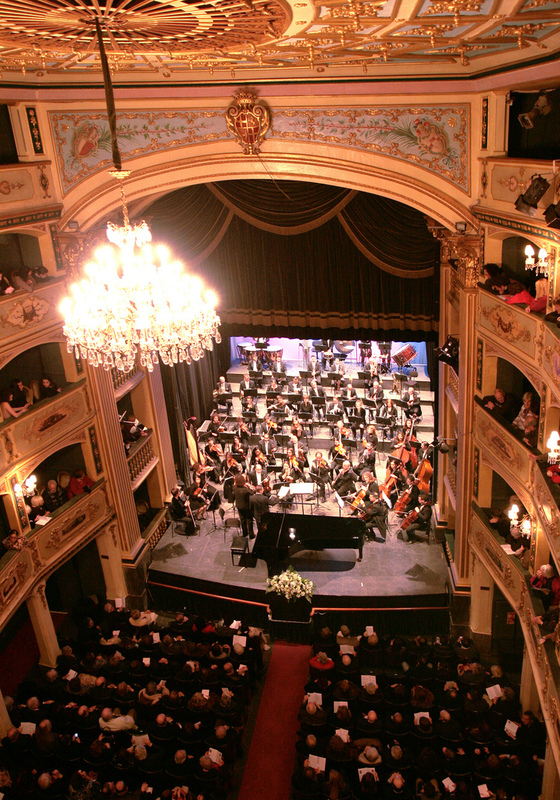 In other words, by increasing participation and participant-led content, you deepen audience engagement with the music and musicians; however, there will be a corresponding increase in unpredictability (in terms of musical outcomes) that you will want to manage, and an increase in constraints on what can take place musically. A ‘participatory’ model of musical performance suggests music is more of an activity than an autonomous thing. The way that participatory music practice is enacted implies a belief that musical participation is something that everyone can do (therefore a human behaviour, rather than a special talent), and that participation is an entitlement, or a right. This suggests a belief in the importance of music participation to individual (and collective) thriving and flourishing. Translated into performance contexts, this belief necessitates a level of reflexivity, so that the performance work evolves in response to the participants as they are on that particular day. The emphasis on people and experiences means that process is often as important as the finished ‘product’, even more important sometimes. Why is it useful to unpack and discuss the values that underpin performance traditions? It’s important for musicians to feel good about the work they do in community settings. If they don’t, they will be less inclined to initiate or take part in these performances, and our communities will be far poorer as a result! Furthermore, many orchestras and classical music organisations are under pressure from funding bodies to engage more directly and meaningfully with communities – that means being responsive to what communities would like from them. Putting on a free concert in your normal venue then shrugging and saying, “well, we’ve done our bit” doesn’t really cut it any more. Examination of underpinning values helps performers to position the meaning of the work in a larger social context. Armed with this understanding, and of the different elements that make up a perception of a ‘fourth wall’, performers can begin considering and playing with these, making them less rigid or less distinct. In this way, performances become an invitation to connect and share in something in which everyone has a stake. Last weekend I worked with graduates of the MSO ArtPlay Ensemble to create music for a special event – ArtPlay’s Tenth Birthday. 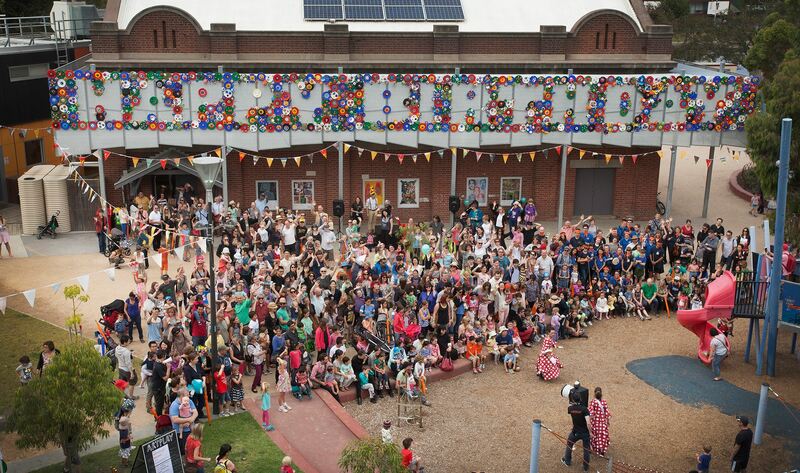 ArtPlay is Melbourne’s children’s arts centre. Actually, it is probably Australia’s only dedicated arts centre for children. The ArtPlay philosophy sees children and artists as co-creators – it is a space where children get to work and create alongside professional artists in a rich and diverse program of workshops, performances, installations, and exchanges. It’s my favourite place to work, because the staff are all so dedicated to optimum experiences for everyone who comes into the space. There is such impeccable attention to detail, and so much love, care and appreciation – mutually shared, I should add. I’m very proud to have such a long association with ArtPlay. 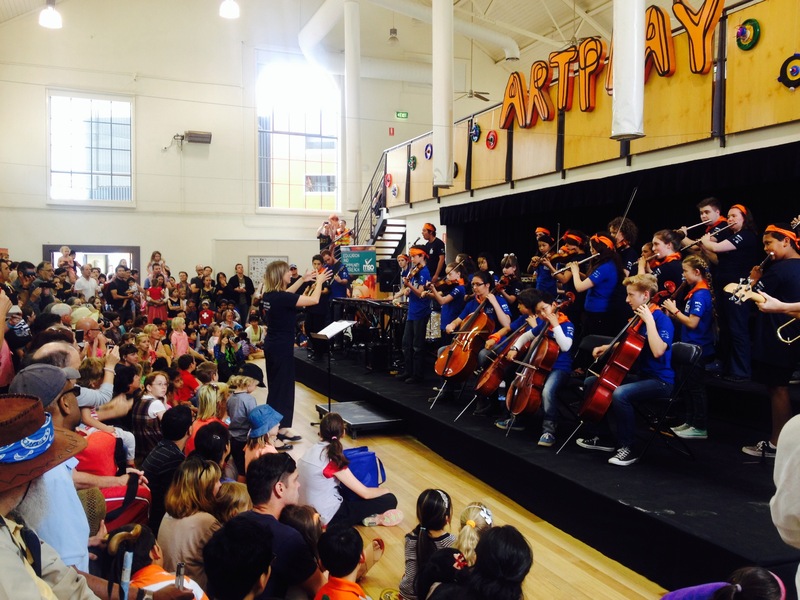 The MSO ArtPlay Graduate Ensemble is made up of children from past MSO ArtPlay Ensembles – we create a new Ensemble every year, and have graduates from the first iteration, in 2005, all the way through to 2013. In this particular Graduate Ensemble project many of the older graduates came back to be part of the project – that was pretty special. Some of them are now in university! In our opening circle on Saturday, as I welcomed them all, I pointed out that every graduate of the Ensemble is part of a musical community, and that with every year that passes, their musical community grows. It includes people they meet from youth orchestra, from university, and it includes me and the MSO musicians they have worked with over the years. We are all part of the same community of Melbourne-based musicians. Here in the Graduate Ensemble, everyone has shared an experience of working collaboratively as a group and the strategies you can use to get your creative faculties firing. This was immediately evident as we started the warm-up games. We passed a clap around the circle – straight away, it was whizzing its way round, speedy, focused, and committed. “These are my kids,” I thought proudly! Next, we walked through the space, each person choosing their own path but committing to straight lines in a particular direction, and to focusing their eyes on their chosen destination. With inexperienced players, this task of walking autonomously doesn’t make a lot of sense. But with a group that understands and follows the instructions, it is magic. A focused group is able to ‘read’ each person’s intentions and make small adjustments accordingly. It looks impressive when it works – people walk their chosen path deliberately, and there are no collisions! Even more importantly, it is a very connecting task, which heightens the sense of ensemble. We upped the speed – still no collisions. Yep, I thought. We are all on familiar territory. What’s more, everyone is here because they want to be, because they like what happens in this territory. We broke off into small groups. Some of the older graduates took on leadership roles in their group. We didn’t ask them to do this – they just did it. I imagine that this may have been in part because they work in Ensembles in other contexts, where older people lead the younger participants. But it was also about familiarity and confidence with the creative processes we use in the Ensemble, and that I use in projects with older kids, which some of them have taken part in as well. It was a cool thing to observe. Again, flushes of pride! At ArtPlay on the Sunday, we had a beautiful stage to perform on. As always, figuring out the configuration of groups, instrument sections, power leads and sight-lines took a bit of time (it’s the part of these projects I like the least), but our rehearsal went well, and in the last five minutes (nay, three!) we also devised a rhythmic groove to play outside, in order to draw the audience into the ArtPlay building from the playground and performances outside. It was a lovely event to be part of, a celebratory event for ArtPlay that was also a chance for the staff, the MSO musicians and myself, and all the parents that we have come to know over the years, to reflect on the creative musical community that we share. It will only grow more. A Facebook friend recently posted a discussion starter – what’s your favourite Christmas CD? I was horrified by some of the suggestions – there is little I dislike more than faded pop stars and hip young things giving their melismatic and affected performances of classic Christmas carols. What were my friends thinking? My nomination was for Tijuana Christmas (by Tijuana Brass). We had this LP when we were kids and it was our absolute favourite, guaranteed to get us jiving around the lounge room in our pyjamas and getting giddy. It’s still my absolute favourite. A few years back my sister tracked down a copy of the LP and made a CD of it for me. It only lasts for 38 minutes, so it gets a fairly constant rotation on Christmas Day here. Start playing it now! It’s the best. Dig those vibes! (I mean the vibraphone, rather than groovy feeling, man). I confess I am a Christmas purist. I like it old-style. Tinsel and pine trees, special tree decorations (added to each year with one or two special finds) and nativity sets. Nothing proves this more than the fact that every year, I host a Christmas carol-singing party. I invite everyone I know (and some people I don’t know but that others have told me about) that likes to sing carols in the old-fashioned, ‘Oxford Book of Carols’ way. We gather together, we bring food to share, and we sing through all the carols. Then we hit the streets and go and sing for the neighbours. Sometimes they give us money, and we give this to a charity. (Or as one friend put it on Sunday night, “Walk the streets for money – you don’t care if it’s wrong or if it’s right!”). Yep. Indeed. “You have your own Christmas tradition,” my sister observed this year. It’s quite a long-running tradition now. It first started when I was still a student at the Victorian College of the Arts (waaaay back in the late 80s/early 90s). A group of friends and I decided to form a small group and market ourselves as carol-singers to shops and department stores in the lead-up to Christmas. We got booked to do a few gigs, made some money and had a lot of fun. A year or two later, living in London as a post-graduate student, another group of friends and I did the same thing. We got a series of gigs in a chain of upmarket pubs (called ‘The Pitcher and Piano’). The deal usually included food as well as cash – always a welcome offer for cash-strapped students in London. The following year we talked about reforming the group and doing it again, but we never quite got organised with the marketing. Suddenly, it was the 20th December… and time had run out! So we got together anyway, and just sang the carols for the fun of it. I think the carol-singing party tradition started there. 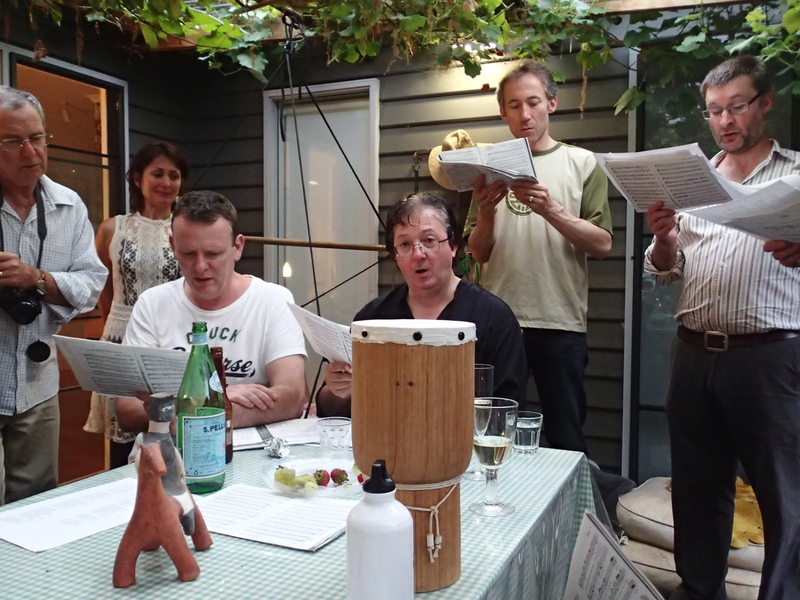 Back in Australia, I invited friends around to sing, usually on the last weekend before Christmas, and it always happened that only those that wanted to sing came along. Everyone else stayed away. It meant that I didn’t have to worry about it being a boring or daggy event for people – everyone who was coming along was a bit of a purist like me, it seemed, and a lover of carols sung the old-school, four-part harmony way. No melismatic or faddish soulful renderings to be heard at all. The party was usually held wherever I was living at the time. I remember one party in the back yard of a share house in Parkville, where we cooked up a big barbecue and tried to accompany ourselves on my new piano accordion (I couldn’t play it then, and can’t really play it now). Another year, we had it in my top-floor flat in North Melbourne. Somehow I managed to persuade a percussionist friend to bring his vibraphone to accompany the singing. He lugged it up four flights of stairs. He has never come to another carols party. I think I might have used up all of his good will on that night. More recently, the party has been held in the home of my good friends Simon and Victoria, who are carol-singing regulars. They have a beautiful home with lots of room for people, song-sheets and large platters of food. They have hosted the event for the last few years. I even have a name for the event now – ‘Oh Come All Ye Faithful’. For some of the regulars, it is one of the only times we see each other each year. Traditions that belong to the carol-singing party have evolved, such as the deliberate mis-singing of Verse 4 of While Shepherds Watched Their Flocks (“Thus spake the Seraph and forthwith appeared a Shining Thong”). Hehehe. I always giggle. Other songs always choke me up. I can’t get through Oh Little Town of Bethlehem without getting a big lump in my throat – awkward when you are the only person on the alto line. It’s the carol I loved best when I was a child. I remember getting a song book from a carols night at Ringwood Lake and being thrilled to be able to learn all the words to this carol off by heart. I practised it until I knew it. It was rarely sung at the carol services we had at church, so I had to sing it on my own at home, to get it out of my system. These days, Christmas brings more pressure and madness than ever before. We are busier. There are more people to see, more friends and family to connect with. It’s hard to get a sense of Christmas spirit – that feeling that reminds us why we do all these busy things, because in fact these are people we love and care about – when everything feels so rushed. The Christmas carols party is proving to be a way for many of us to usher in our own sense of Christmas spirit. The songs that get played in the supermarkets and department stores don’t do it for us. Singing the songs ourselves, in the glorious, beautiful harmonies that we first learned years ago (and in some cases are still getting right), is what will get the eyes shining and the mouths smiling, and the goodwill and good cheer flowing. Traditions are important. They keep us grounded and connected. I’m happy to find that without ever really planning it to be so, I’ve created a Christmas tradition of my own that is important to many people other than myself. 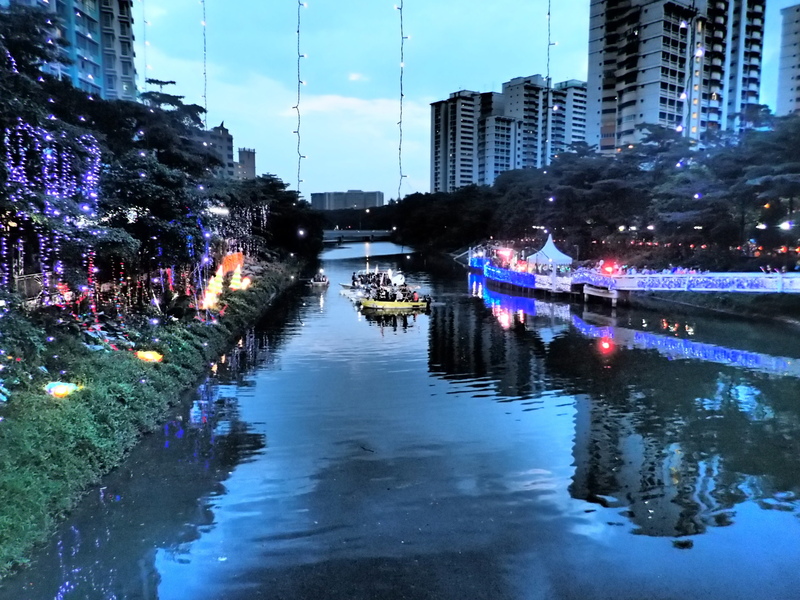 Back in October I travelled to Singapore to take part in a music education conference. While I was there I made contact with a number of organisations working with music and communities, and was invited to experience the opening of a community singing festival supported by PassionArts, the arts and cultural team behind the People’s Association. The People’s Association works on behalf of all of Singapore’s residents living in public housing (which is most people). 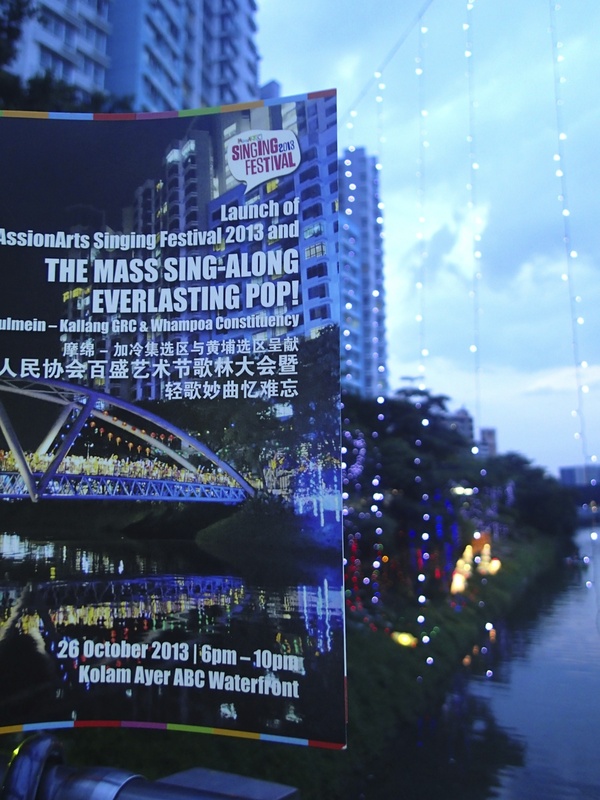 The singing festival was a big event. It was on the banks of a river, with seating arranged on either side for participants, and performers located on barges and small boats as well as on the river banks. There was festoon lighting in the trees and on the footbridge connecting the two sides. I arrived quite early and sat on one of the benches on the footbridge. There were other early-birds nearby who greeted me and shared the songbook program with me. One older man gave me a plastic flashing light stick, and showed me how to switch it on by pulling out a small plastic tag in the handle. Cool! The songs in the songbook represented the principal languages and cultures of Singapore – Mandarin, Tamil, Malay and English. I saw that later in the night we would be singing a massed rendition of “Top of the World”. Early in the program were some patriotic songs, praising Singapore as the land of many united peoples and cultures. The people around me were mostly elderly Chinese, or parents with young children. Many people were crossing the bridge too. There was a space on the bench beside me, and life got interesting when three young boys bounced up, filled with excitement, and asked me if it was free and could they sit there. “Yes, of course!” I said, and they clamoured in. The oldest of the three was probably about nine years old. The other two were younger, aged maybe five and six, that sort of age. A fourth boy joined them not long after and tried to climb into the bench space as well. As you can imagine, they began to laugh and push and climb on each other. They were filled with energy and cheekiness and boisterousness, and had little concern for maintaining a low profile or subduing themselves in the presence of all these older people. They reminded me of the boys in Timor-Leste that used to come to my house everyday to play music. They asked if they could see my light stick. I showed it to them. “How do you make the light work?” asked one. “It’s a secret, see if you can figure it out” I replied, wanting to give them permission to play with it and figure it out. Of course they found the plastic tab quickly and the light stick was duly waved in the air for a while, before being politely given back to me. I loved observing these boys. They were clearly so excited to be there. They spoke to each other in Malay, with only the oldest being confident in English. They pushed and jostled and laughed and joked, all the while responding to the developments further down on the river bank, where things seemed to be in the final stages of preparations. However, their boisterous energy drew some frowns from my neighbours. People admonished them to sit still and be quiet. They looked over at me the top of the boys’ heads, shaking their heads and frowning slightly. Then the younger boys decided they wanted to go somewhere else. They scampered away as quickly and nimbly as they’d arrived. The older boy lingered slightly and said, “We’ll come back. Can you mind this place for us?” “For sure,” I agreed, and put my bag on the seat. At first I did a good job of protecting the seat. Other people nearby seemed to think it was unnecessary, but the boys had asked me to do this and I had agreed, so I wanted to be true to my word. “They should be with their parents,” one person muttered. Another shook his head and said, “Well, they haven’t paid”. (It was a free event, but paying $2 bought you a show bag with the songbook and light stick in it. I hadn’t done this either). The boys came back after a short time, squeezing in beside me again, and I felt pleased that I had done as I promised and kept their seat for them. I fell into conversation with the oldest boy again. But within ten minutes or so, he and his friends got up to leave again, and once again, they asked me to save their seat. During this second absence, there was a lot more demand for seats on the bench. An older woman, with a younger woman and a baby in a pram, asked if this space was available. I explained that some younger boys had been sitting there and had asked me to save the spot for them, but the other people around me began shaking their heads and saying words to the effect of, No, this space is not for them. I didn’t like to see the older woman standing, nor the younger woman and the small child. So I relinquished the space. The singing began and people around me joined in with huge enthusiasm and an impressive and undeniable commitment. This event was not just a fun pastime, it felt like it was important to them on another level – important to sing together, important to contribute their voices to the overall sound. The time came for me to go. The young boys hadn’t come back, so I said good-bye to my neighbours, and offered the light stick and songbook back to them. “No, no, take it with you,” they told me. But I was about to get on an aeroplane to Europe – I knew that was not a practical option. I climbed off the bench with my big bag, and that was when I saw that the oldest of the three boys was standing behind me. He must have returned, but seen immediately that the space for him to sit in was no longer there, so just stayed standing behind. I wondered if he felt I’d let him down. I was really pleased to see him and greeted him. I gave him my light stick and told him to sit in my place. I didn’t see whether he decided to do this or not. I loved the way that this boy in particular was so interested in the community singing festival event. It attracted him. He was drawn to the pageantry, I think, and to the fact that something like this was happening. He was wide-eyed and engaged, and excited by what was going on. But it didn’t seem straightforward for him to be there. He wasn’t a natural fit with the rest of the audience-participants. This made me think about the reality of community events – ostensibly they are for everyone, but will usually become dominated by a particular group – whether that be an age group, a social class group, an ethnic group, and so on. This is one of the tensions inherent in organised community events. They are about social bonding and shared experiences, but they are also about inclusion. People will be bonded as a group, but the group must at the same time always remain open to newcomers. It is a commitment that the group makes (asserted and reinforced constantly by the group leader or organiser) at the foundations of it its very existence. The contradiction inherent in the unconditional welcome when coupled with bonding through shared experiences is a challenging quality to program for and manage. The larger the event, the less control the management team will have over this characteristic being maintained. Perhaps this was something of what I observed on the footbridge at the community singing festival. I thought about the boy for a long time as I made my way back to my accommodation and got ready to go to the airport. He moved me enormously. I thought about how precious that spark of curiousity is in a young person, and how filled it is with promise and potential. It can also be easily extinguished, through lack of nurturing – being blocked outright, or left alone to dwindle away. I hope that this young boy is already someone who is engaged in organised and participatory activities in his community, that his curiousity and openness has been identified and is being nurtured and encouraged. So many people – young and old – live in a way that is confined by the rules and expectations of their social group. They conform. The small number of people who, from a young age, are seekers of new experiences, curious about what else is out there, and prepared to take calculated risks in order to learn and grow, are important to nurture in our communities. They can be catalysts and leaders, or simply the people that proffer an alternative point of view, through having the courage to hold their own convictions. I’ve just returned home from three weeks in Mostar, where I’ve been researching people’s experiences of the Pavarotti Music Centre. This is a complicated and complex environment, and the Pavarotti Music Centre is a project that many people have experiences of, and have strong opinions about. My approach is to try and gather as many different perspectives as I can, from people with very different experiences (ranging from those who had a lot of involvement, to those who had little, and including community leaders as well as staff members, former participants, and casual onlookers, of all ages), and see what kind of picture emerges about the PMC’s impact on this city. This is also quite a small city (you can get everywhere on foot, for example. Nothing is extremely far away from any one point). Local people sometimes describe it as “a big village” because of the way they tend to see people they know by chance in the street, every time they leave the house. Everyone knows everyone. But like any place, large or small, stories have a way of evolving as they change hands and are retold. Speculation can be retold as fact, and can reach such heights that it can be difficult to know what is true, what is exaggeration, and what is pure invention or manipulation. When the stories are about something in which many people may feel invested, or a sense of ownership, and about which opinions are still strong, you can expect to find some contestation of facts. I’ve anticipated this, hence my intention to gather as many ‘witnesses’ as possible, despite the fact that some of my participants would consider other participants to be unreliable. As an outsider, how likely is it that I can find my way through the different stories towards some kind of ‘truth’? Complexity sciences would warn against the desire to ‘aggregate’ findings; instead, the recommendation is to make a detailed examination of the context, and to ensure that each witness ‘report’ remains embedded within its context. In this way, you can at least position the words within their setting and attempt to understand them, their meaning and motivation within that. It is in isolating details from context, and then drawing them together in aggregates, where conclusions can be drawn that are not in fact an accurate representation of the site and the experiences. In any case, each person’s experience is theirs and theirs alone. So often, research presents us with aggregated or averaged information – but is this general set of aggregated experiences more true than an individual’s experience and perception of that? When we look at impact, what kind of impact is the most relevant or important – that of the collective, or that of the individual? Changes can be far starker in an individual than in a collective. And if one life is changed for the better, this is important to know, as the impact of that change on a community over time could be significant. 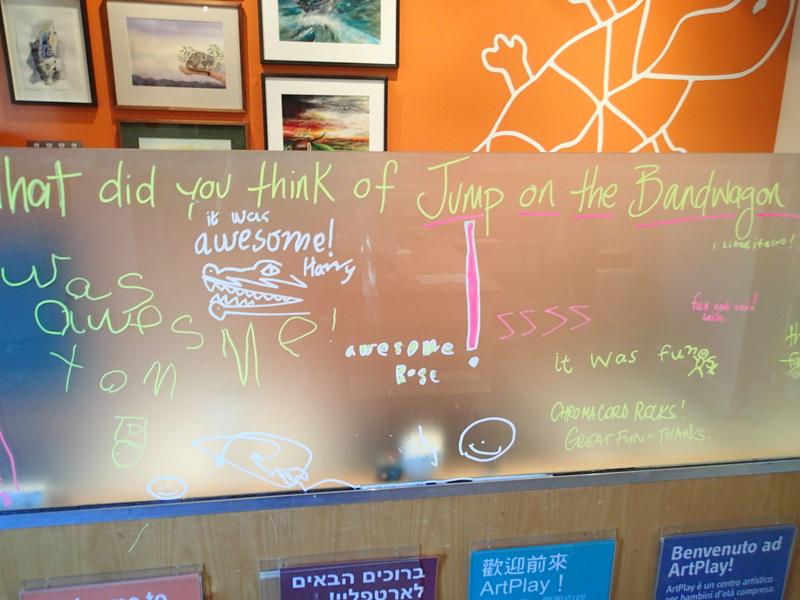 Recently I led this year’s Jump on the Bandwagon project at ArtPlay. Jump on the Bandwagon is a family jam – an all ages, all abilities, get-your-hands-on-an-instrument-and-play event that is about getting large groups of people playing together and sounding great. Regular readers will know that I lead lots of jams with orchestras, and these usually take pieces of orchestral music as their starting points for improvisation and jamming. In Jump on the Bandwagon, we focus on grooves and riffs with a more contemporary edge. Often I use a melodic idea that’s emerged in an earlier workshop with young people – some of these can be very enduring and an ideal starting point for a big range of musical interests! Money does not buy family, friends or love. We always get a crowd of participants – this year we capped the registrations at 100, and most were these were under-8s, including one 7 year-old violinist, filled with ideas and no qualms at all about being the only violinist there, a little girl who opted to play the keyboard but had brought her own ceremonial trumpet along, and a 2 year old who spent the whole time struggling with his mum to have control of the drumstick and being massively overstimulated by the whole event, but ended the session by helping gather up all the instruments, hugging me good-bye, and not wanting to leave. I hope we get to see him again! But some of the most memorable participants were the adults. I asked one dad to play the autoharp and showed him how it worked, pushing down buttons for particular chords, and strumming across the strings in time. One of the other musicians in the Bandwagon team told me later, “He loved it! He absolutely loved it and said, ‘It’s my first time EVER playing music, and I think I’ve found my instrument! '” That’s a great outcome, and just as important as any younger child having their first experience playing music. Research shows that the music experiences children share within their families are way more powerful and potent than any music experiences they may have in school, in terms of impacts their later choices to participate in music experiences as adults. That’s why I emphasise all-ages with the jams I lead. Of course they are for the children. But they are also for the adults. And if that man goes off and buys himself an autoharp of his own then that will be one of the best outcomes of a jam that I can think of.